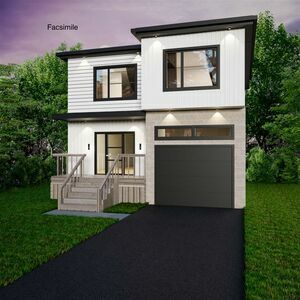 62 Mica Crescent, Spryfield (MLS® 201824873): Bowers Construction is pleased to provide their beautiful, quality homes in the much-desired new Governors Brook subdivision. "The Hemingway" is finished on all three floors with the attention to detail we're known for, our design comes complete with upgraded laminate flooring throughout, two energy efficient ductless heat pumps and must-have finishes throughout with your choice of touches of midcentury, organic modern or Scandinavian design. You can finally call one of your dream Bowers Construction homes your own. A breathtaking open-concept main floor offers a bright and spacious living room with ceilings two stories high, letting in beams of natural light and giving you a home that stands apart. Hot finishes from white, to grey, to marbled, walnut, and pale oak will be found in entertaining-ready kitchens. Upstairs, find three large bedrooms and upstairs laundry room. The master bedroom overlooks the lush protected green belt on Macintosh Run and has a luxurious ensuite bath with double floating vanities and a custom, tiled walk-in shower with glass - made bold with high contrast finishes you'll choose. A basement walkout provides a bright rec room and fourth bedroom plus bathroom. Bowers Construction puts the control back in your hands, offering you the lighting, palettes and looks we are known for, and fresh design concepts by our fantastic interior consultant. It's all a part of bringing your dream to life in the process. Call the listing agent for even more details!